Early in December I went to Brussels to eat loads of chocolate, drink even more (fruity) beer, and do touristy stuff. The latter required interactions with ticket machines – incredibly annoying creatures with rather fancy iPod-style controllers. But before I describe the interface, I need to share my frustrations. First time in my life I was defeated by a ticket machine and it made me feel like an idiot. On the first day of our stay after walking for hours we decided to take the underground back to the hotel. We located a station, found a ticket machine, tried to buy a ticket… and failed. We tried a few times, found another machine, failed again. While the machines did allow to change the language to English, the instructions on the card reader were not only in French, but also abbreviated (so I’m not even sure it actually was French). As a result we had a nice, over an hour long walk through some dodgy-looking streets in a city we didn’t know. Not cool. On the next day we decided to give it another try. There were no ticket offices on any station we found, so there was no choice but to use a ticket machine again. The steps required to complete the task were simple: change language, select a ticket, insert a card, do something, enter the PIN… But the ‘Enter PIN’ message didn’t want to appear. There was something that looked like ‘insert card’, there was something that looked like ‘remove card’ (because the main screen said that the transaction was cancelled), and there was that weird partially abbreviated thing that made no sense. Was it ‘please wait’? Possibly. But waiting always led to a _’remove card’_-like looking message. After a few painful minutes filled with inserting, removing, almost swearing, inserting, laughing nervously, removing, inserting, pressing the ‘Enter’ button on the keypad, groaning… the ‘Enter PIN’ appeared. I entered the PIN, got the tickets and realized that I bought wrong ones. Because the whole thing was so frustrating and there were so many cancelled transactions, I just stopped paying attention to what we were trying to buy. One day ticket instead of a 3 day ticket meant we would have to meet a ticket machine again. It turned out we needed to return to the ticket machine a few hours earlier than expected as it was a “one day ticket”, not a “24 hours ticket”. This time we decided to use a different ticket machine we accidentally noticed on a tram stop. The procedure looked as before: transaction cancelled, remove card, transaction cancelled, cancelled, cancelled, go away, go away, I won’t sell you anything, cancelled, cancelled, cancelled, I hate you. Not sure how I managed not to punch the damn thing. At this point a kind passer-by pointed out that I was using a wrong card and the machine didn’t accept VISA. This was the same card that worked a day earlier. We decided to walk to the station with the machine that sold us a ticket before. As expected, it didn’t work at the first time. I decided to reproduce the steps from a previous successful purchase and after inserting, removing, groaning, inserting, removing, inserting, AAARRRGHHHH, pressing random keys… ‘Enter PIN’ appeared. I managed to please the machine much quicker this time – I learn fast. And I bought the right ticket so didn’t have to use those machines again. Yay! And about half an hour later we found a ticket office. The iPod-style wheel works like, well, and iPod controller: turning it moves the selection on the menu up and down, and to select an option it has to be pressed. Pressed really REALLY hard, actually. But even though it is an interesting concept, it requires more precision than, say, simple buttons with arrows or a touch-screen. It also requires more force than an iPod controller – one finger is not enough, it has to be held with more fingers and twisted. As I’m writing this with a right thumb and wrist suffering from RSI, the idea of using that wheel makes me squirm. 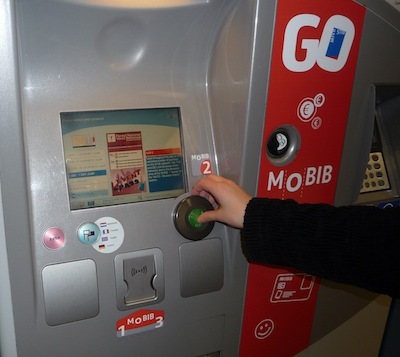 “[T]he GO vending machines accept only coins and local (Proton and Bancontact) debit cards which makes the use of the MoBIB card less convenient”. Does it mean that in all that rage I managed to trick the machine and bought a ticket with an unsupported VISA card? Twice?